The ’90s are back, baby! While the bowl cut used to be an über-popular style for boys, as of late, more and more female celebs are jumping on the bowl-cut train — including none other than Miley Cyrus! First, she had the infamous pixie cut that sent shock waves through the Twittersphere. And just when we thought she was ready to grow it all out, she had to go and get a bowl cut. Ummmm, what!? Don’t worry — we’re just as confused as you are. Miley debuted her new ‘do yesterday, outside a recording studio in Los Angeles. Many compared her choppy bowl cut to that of Lloyd (Jim Carrey’s character) in Dumb & Dumber. Not exactly a compliment, if you ask us, although Miley is certainly no stranger to stealing hair headlines, positive or not. 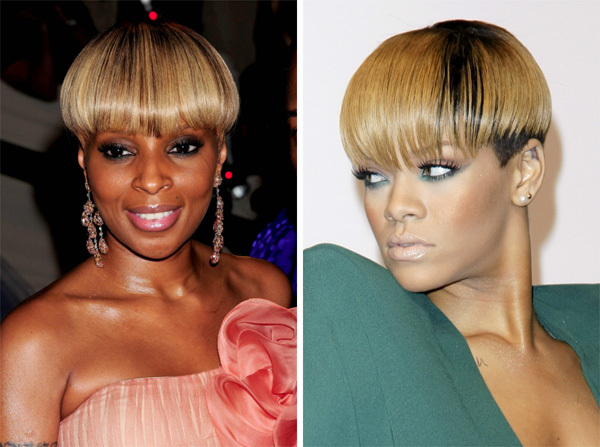 On that note, let’s take a minute to talk about what you should and shouldn’t do if you want to take a chance on a bowl cut like Miley did — and like other celebs who did it far better, such as Rihanna and Mary J. Blige. First and foremost, we spoke with celebrity hairstylist Matthew Preece, owner of the Fred Segal Salon in Los Angeles. Preece believes that Miley’s hair simply wasn’t styled in yesterday’s photos and that her new cut was actually meant to be worn slicked back and up. OK, it’s all starting to make a little more sense now. But what if you seriously want a bowl cut? What are some of the dos and don’ts? Matthew shells out his expert advice below, including some for Miley. If your hair is cut like Miley’s, it’s best to use some gel or pomade and wear it back off your face so that it emphasizes the shortness of the sides and the length on top. You can also use the same product to get some volume and height going up top, as Miley’s often done in the past. Whatever you do, though, don’t wear it forward like she does (at least not out in public, anyway). It’s important to make sure that your bowl cut isn’t such a solid haircut (you know, like you literally took a bowl and cut around the sides). There should be a few wispy pieces in the front and on the sides so that you’re showing some softness. If your hair is too coarse, a bowl cut is simply not going to work. Same goes for round or chubbier faces — this look just won’t be flattering on you, no matter what. Matthew says the best way to test out whether or not you’re going to like a bowl cut is to pull your hair back in a very tight ponytail and see how your face looks. If it looks good and you’re satisfied with the result, then go for it. Obviously, girls with great bone structure will have an easier time pulling off this style. 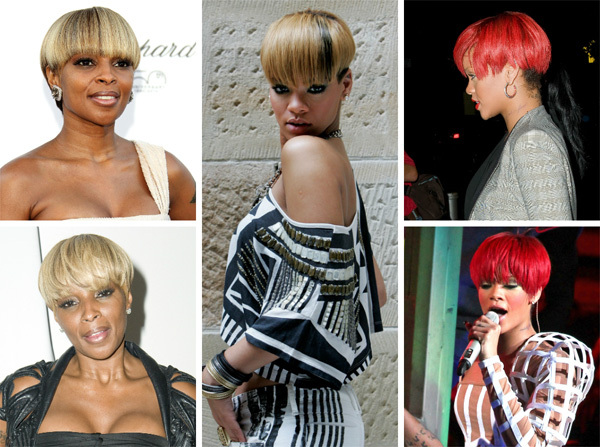 Take a note from Mary J. Blige, Rihanna and even Miley and add some highlights to your hair or go all out and bleach it out. In general, the bowl cut is more of a punky look, so this is a great opportunity to venture outside your comfort zone and use some crazy colors. Anyone who dares to don this look has to be brave, as it’s a very masculine and edgy style. It’s essential that you be confident with your features, too, because — let’s be real — the bowl cut definitely isn’t a do for everybody.